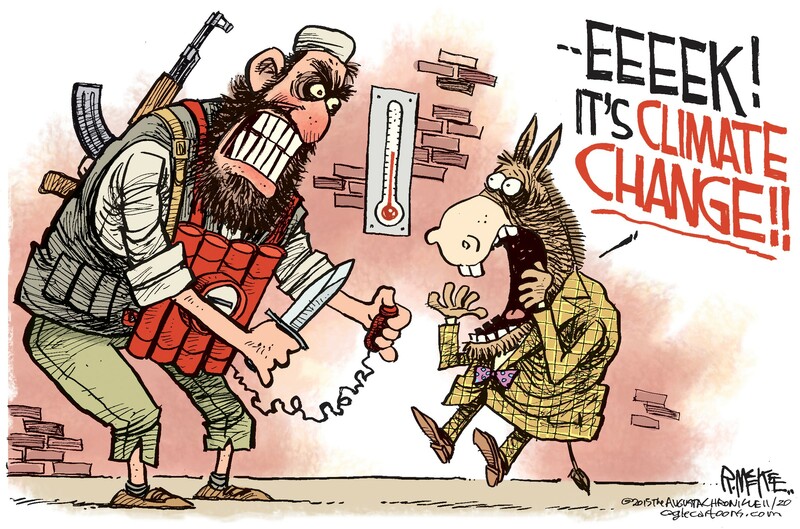 New: Jihad in Paris: Was attack caused by Islam or global warming? First Christmas events just a few days from now: The first Christmas event in Lebanon is scheduled for December 15th. The dinner events for the children in Lebanon are scattered all over the country because the refugees are scattered. There are no United Nations refugee camps in Lebanon despite the fact that over 1.2 million Syrians alone are refugees there. Many camps are supported by the churches in that nation, which is still nearly 40% Christian. Most of our events there will be held in church facilities. In Jordan the dinners are held in urban areas because most of the Christian refugees are located in the cities, principally Amman. In the Amman area we can manage up to 300 children at an event, in addition to some parents. In Iraq the situation is similar to Jordan, and there we have been able to increase the overall number of children. It now appears that we will be able to go past our goal of 4,000 children in 2015. Praise God! Benefactor and matching donors help children have a real Christmas: Supporters of the Christmas for Refugees program responded overwhelmingly to the challenge issued by a benefactor to donate $25,000 if his gift were matched. The expiration of the challenge was to be December 1st but smaller gifts totaling just over $25,000 as part of the challenge were received by November 23rd. For their donations to be counted in the matching gift program supporters had to state that their gift was specifically an answer to the challenge or send the envelope to a special post office box address set up just for the matching gift challenge. No other gifts to the Christmas for Refugees program, such as Internet donations were counted. The day the challenge was met the benefactor, who lives on the West Coast, transferred the promised $25,000 to the Religious Freedom Coalition. As a result, the Christmas program is within just a few thousand dollars of budget. This is in contrast to 2014 when we were still short of the funds needed on the day the first dinner was held in Lebanon. Hundreds more Christian refugee children will receive the blessing of a real Christmas this year as a result of the generosity of the benefactor and those who met his challenge! A heartfelt thank you to all who have helped make this possible! The Dwekh Nawsha fights for the Ninevah Plain: There is a Christian army in Iraq fighting the Islamic State, but sadly the Obama Administration and the mainstream media do not want the world to know about it. The media backs the whole McCain / Obama agenda for Syria, saying that “Assad must go” and that the only hope is the “Free Syrian Army” which only exists on paper. The Assyrian Military Forces began fighting in the summer of 2014 after the Islamic State swept through Mosul and into the Ninevah Plains, imposing sharia law. The Christian Assyrian Army, known as Dwekh Nawsha, is in desperate need of military assistance from the Obama administration. Dwekh Nawsha means “self-sacrifice” in the ancient Aramaic language used by Jesus and still spoken by the Assyrian Christians today. One Assyrian Army commander said, “We are losing not only the Assyrian people, we are losing the Christianity.” The Ninevah Plains have been the home to Assyrian Christians for almost 2,000 years. Obama calls jihad in Paris just “a setback.” What does he see as a threat? President Obama sees more of an urgency in dealing with “climate change” – whatever that is – than challenging the Islamic State as its tentacles wrap around and strangle Western civilization. He also wants the West to take in tens of millions of Muslim refugees from the “horse latitudes” because “climate change” is making the area a desert. What? “Horse latitudes?” – The horse latitudes are regions located at about 30 degrees north and south of the equator. These two latitudes are characterized by calm winds and little precipitation. The northern one runs over the major deserts in the Middle East and Africa while the southern one runs through the desert areas of Australia. These areas have been hot and dry for thousands of years. Medina was just as much in a desert region when Mohammed conquered it as it is today. The name “horse latitudes” came from the days of sailing ships having no wind and running low on water. Sailors would have to toss the animals, such as horses, overboard. The religion of climate change, in which Barack Obama is a believer, holds that the expanding deserts in the Middle East and Africa are new events and the root cause of terror in the world today. According to the true believer, the Syrian Civil War and the refugee crisis in Europe are being caused by Global warming not by the Islamic State. I am not making this up. Got that? Climate change is causing civil war and sending massive numbers of refugees north to Europe. The murders in Paris were caused by climate change, not Islamist terror. 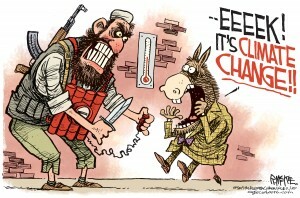 The core belief of the left in the United States is that the entire unrest in the Middle East and North Africa is caused by “climate change.” As the leader of the far left, President Obama has said more than once that “climate change” is the number one enemy of America. Much of what James Cameron said has been repeated by leftist leaders not only in the United States but in most of the Western World. Even Prince Charles has boldly stated the Syrian Civil war is a result of global warming. In Obama’s thinking, Islam is peaceful and those committing acts of terror simply need to be relocated to Europe and the United States and be given high paying green jobs that do not pollute. Once employed, Muslims will no longer kill in the name of Allah. Add all this to Barack Obama’s early education in an Islamic school in Indonesia and his stated belief that the Muslim call to prayer is “one of the prettiest sounds on Earth at sunset.” In 2007, then candidate Barack Obama was still able to recite for a New York Times reporter, in perfect Arabic, most of the Adhann (Muslim call to prayer) he had learned as a child. With a president who follows the Climate Change religion and is also convinced that Islam is peaceful and that Christianity is the religion of the violent Crusaders, is it any wonder he does not see the Islamic State as a significant threat? This thought that climate change is the core issue is so embedded at the White House that when the truth started to come in about the Islamic State, the intelligence analysts were told to “cut it out” and “toe the line” when reporting on terrorist operations to the President according to emails released by a whistleblower. The views of Presidential candidate and former Secretary of State Hillary Clinton are not much different than those of the current president on these issues. As does President Obama, she sees Saudi Arabia, not Israel, as being America’s most reliable ally in the Middle East. (Citizens of Israel are not allowed to enter Saudi Arabia for any reason.) Not a word comes out of Hillary Clinton’s mouth that is critical of the horrid repression of women and near slave condition of foreign workers in Saudi Arabia and other Islamic states who are “allies” of the United States. This is despite her claims to be an “advocate” for women’s rights and a friend of the poor. Many believe that Barack Obama is a Muslim, and that this is the reason he moved to overthrow secular governments in the Middle East. His sympathies for Islam and his many anti-Christian statements (although stating he is a Christian), are just some aspects of his overall support for Islam and institutions such as the Muslim Brotherhood in places such as Egypt, and his support for Muslim immigration to the United States and Europe. Some of Obama’s deep rooted reasons for favoring Muslim immigration to the United States are probably racist, and some have to do with his childhood as a Muslim, but much has to do with an all-expense paid education at liberal Ivy League institutions such as Harvard University where he learned much of what he is putting into practice today. For whatever compound reasons in his background, Barack Obama’s beliefs stand in stark contrast to those of Bible believing Christians on issues ranging from abortion, to the divinity of Jesus Christ, to the acceptance of Islam as a “sister religion.” Before the Barack Obama presidency draws to a close in January of 2017, Americans must be ready to expect even more far left lunacy from the Whites House with regards to Islam and the repression of Christians, including the mass importation of uneducated Muslims from Somalia and other African nations.